Marcia left her home in VIC in a tan Mitsubishi Sigma sedan Reg No. DUP002 to travel to QLD to visit her parents. She had a black and white Heeler/Border-Collie Cross. The car was found abandoned on the Princes Highway near Moe. Marcia’s wallet was found further along the highway. 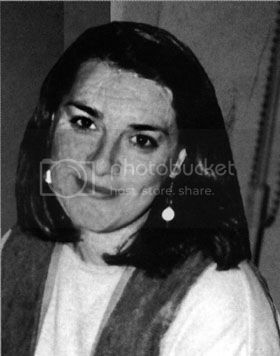 Marcia was last seen on 19 August 1996 in a distressed state by a truck driver but declined a lift and kept walking along the highway. She has not been seen since. Please note that tarot covers PAST PRESENT AND FUTURE circumstances and events. I cannot place those events accurately therefore no 100 per guarantee can be given on the insights. I have a request on the blogger to see if tarot can throw any light on this lady Marcia Ann Ryan. It seems she has been missing for a very long time.about 14 years. I cant guarantee 100 per cent results but I hope that tarot might be able to at least give us some thoughts/ideas on the matter. This card the 9 of Wands reversed shows me Marcia is frightened. For some reason she is ill or has illhealth because this card shows her strength slipping. This card can also show she was attacked. I see that the Moon is attached to this card also which does not sound promising and also the direction of WEST. Marcia seems to have gone into a situation a bit impulsively it feels like she was worried about being attacked but as it suggests an attack in safe circumstances it could be that someone tried to attack her in her vehicle . Marcia was completely unprepared for this so it must have been something that she really did not anticipate at all. South is also linked to this card so it could mean going in one direction but ending in another. The Moon is in Sagittarius on this card and Sagittarius is known as adventurous and linked to those who like travelling. The Moon is a dubious connection because illusions and even shadowy situations can happen underneath it. I am wondering if Marcia was flagged down to give somebody a lift. If this occurred that somebody could have attacked her and is the reason why she was walking up the road and refused a lift from another driver. This woman was suffering from shock. She must have been grabbed or hit because there is a bandage on the head of the person in the tarot card but it seems that it weakened her. When the card is upright it shows someone waiting for an enemy and in this case the card is reversed and I think she was running away from someone. There really does seem to be some calamity in this card. The 9 is a completion card and this is reversed.This is an incomplete situation for the date she disappeared and suggests her Journey/adventure suggested with Sagittarius was derailed. Looking at the card preceeding 9 of wands, we see the 8 and that shows Marcia going across country swiftly - the card depicts buildings that are in the distance and perhaps a stream in between. Then if we jump past the 9 of wands we see the 10 of wands and its someone who is walking towards buildings which can indicate they are walking towards civilisation - town - the only problem is that the person seems to have a burden to unload. They are very oppressed. Trying to get an angle on what happened 'after' Marcia refused a lift I have been given the 5 of wands. First though I will go the card before that which is the four of wands which shows a home. So I am assuming that the truck driver asked her if she wanted a lift home. Then we have this 5 of wands which seems to suggest a struggle of some description. The card following that is the six of wands which is someone going towards the town in a vehicle. Well at this point - it has to be asked what questions were asked of the truck driver. Everything he has to say is very important. Its at the point of the five of wands that money comes into play, so I guess somehow there has to be a point where someone wanted Marcias money or she offered it either to stop someone bothering her or because it was demanded of her. I dont think it was money offered for a lift but I could be wrong. I just see some kind of squabble/struggle or quarrel at this point in the cards. This is definately a red flashing warning sign here. Its possible that the truck driver did exactly as he said and drove on, but if that were the case then there is definately something else in Marcias path. The 5 of wands can mean a group of youths messing around but that would indicate that they were 'hanging around' somewhere on her journey and she bumped into them. Im not sure of the area so I cannot really envisage or pinpoint the road she was on. If there were fields either side then it would be at that point that this struggle occurred. It could be heated differences of opinion that occurred or someone losing their temper so it does indicate that Marcia must have had company somewhere along the way. I do think that the five of wands shows that Marcia was the weaker element to her opposition - and its possible she was overpowered. What would bother me is that the six of wands comes next so its 'after the fact' and it does show someone in a vehicle going into a town marketplace - and because the horse in that card has a canopy on it suggests that something is hidden, it also has a laurel wreath attached to a pole. It could suggest that someone picked Marcia up and took her to a town or at least advanced towards a town. That obviously contradicts a lift that was refused unless there was another offer that came along or that she did flag someone down. I rather think these cards put a lot of finger pointing on the truck driver or someone else driving along that road. Whoever this person is in these cards he is wearing something on his head. He could be blonde/white/grey/ginger or strawberry blonde type colouring. He has a knife? shovel? tool? and this woman has been betrayed therefore someone must have somehow made her feel safe and clearly that might have been a bit foolish. The following card shows that she is on a hill of some description and fighting off her oppressor . A hill can be actual or incorporated into a road name etc, the person is,nt actually attacking her but it is the feeling that they are going to as far as she would be concerned.It is possible she lost a shoe? The eight of wands takes us back to the original journey across the country so it seem to me that everything took place between the five and the 9 of wands. Then as we look at the aftermath which is the 10 of wands we see this. Notice the colour of the hair in the picture. This looks to me like a person who is carrying something as before mentioned and they are carrying that load towards some buildings. They seem to have come from the country and they are going to deposit the load near the outskirts of that town - this card is Saturn in Sagittarius which to me is a traveller who has to THINK - use his/their intelligence with the load that they have there. If Marcia is no longer with us, she was buried in the earth next to some buildings just like you see in that card and Marcia would have been disguised in some way, wrapped up or somehow covered in appearance. This card can represent loss. This is the description of the man I see there in the 10 of wands. A man like in colour to gold, or an idle man playing with a staff; and the signification of this is in following our own wills, and obstinacy in them, and in activeness for evil things, contentions, and horrible matters. Therefore Im afraid it does look like Marcia could have met somebody who did not have her best interests at heart. Its possible that Marcia is near a seat it could be a stone seat so I may be wrong. Perhaps its somewhere that water is not that far away but there are two sections of land the cards like to call them islands and these are in the distance. This is the way tarot tries to name a place ( never very helpful when you dont know the area) . Two of swords can refer to rogues or roguery. When I asked whether Marcia has died - I seem to get a maybe answer. The cards actually ask us to choose the outcome which I think is rather strange. Obviously the person that was with her knows but no one has been told have they? According to Iching Marcia applied her brakes and stopped the car because ahead of her were 'bandits' - thats the way Iching talks about things. So clearly she wanted to avoid something up ahead. She may have bumped into a small gang of men/boys who were messing around with her and annoying her, they could have been the ones that linked to her wallet. Then it seems she got to safety after that and that would be where she met up with the truck driver. The Bandits would fit perfectly with the 5 of wands - where there is no harm done exactly but a very upsetting and scary situation for her. We also have the South and West in the Iching so its backing things up here and also there is a suggestion of meeting an adversary. Clearly we know that Marcia was in dire straights on that road and that someone was there and a big problem for her. There is a stream in the cards and I would still consider saying to check those areas any streams or brooks nearby as she could have made her way towards one I seem to see this though I cant seem to figure out at what juncture she did this. I still see her in a safe position there though - I am actually wondering if Marcia is still alive and has lost her memory. I can see all the negative things in this reading but I cant see an ending for this - its very strange. I would always recommend asking again the driver of any more information. I do not see Marcia out in the countryside I see her near a town. I do not have any indication that she is dead or buried only that if she was that would be the place she would be found. Looking at the 'disguise' element it could honestly be someone who has simply lost their memory. They are in fact in disguise in that situation because they are not the real person they are. I really dont know any background to Marcia and it would really help if I did know a little at this stage of this reading because it is left so open ended. Was Marcia someone who kept things to herself? was her past life fine? would she have any reason to want to walk away from it? If these questions can be honestly answered then it can decide the fate of Marcia today.I have tried to give indications of what may have occurred with Marcia and there is a severe look which would result in demise and there is another situation which does not suggest it all. The outcome here is that people will and do think she has likely passed over. it seems that she has problems of some kind that are causing her great troubles, so that is why she cannot see/contact you for the moment. This might refer though to the point at which she disappeared and be suggesting that she was having those troubles and is the reason why she dissappeared and could not contact her loved ones. Also something important may happen in perhaps a few months time (March?) that will literaly shake her world up. Whatever it is will bring her back to reality and thoughts of you because some obstacle will be removed, it will then give her the freedom to see/contact you again, plus she will be in a much happier frame of mind. Now this has either happened or it has,nt. Only the family knows if something happened in March - and whether this information is in the past before she went out on that day. It could be that if she did lose her memory that it was,nt until the March that her memory returned? but had that been the case one would have thought she would have contacted her family. I need to consider things a little more as I seem to have a cross scenario here and you can guess I am slightly puzzled. I also need to ask the family if they read this to strike a balance with emotion. The reason why is because if Marcia has passed on it is absolutely paramount that this reading does not infuse a 'hope' as that is just upsetting if it turned out to be false. Asking why Marcia has not contacted her family I was told by Iching that either its because that day she was shouting for help and that gave her adversary a clue where to get her which would suggest she attracted them to her, or quite frankly it means that she does,nt want to be contacted because if she was then the person who she is trying to avoid will find her. This explaination from Iching is how I have come to this conclusion. The subject of 43.2 may even be justified in fearing an attack, but even here his worry is self-defeating - all of his cries of alarm and his rattling swords are preventing him from listening for his enemy's approach, and it's also giving his position away. If Marcia is still alive she was with somebody but she would not be able to change the status quo at this time. If she is not she can be found near the River Bank and a small town. If she is connected to the River and the entire reading is a negative for her, she wont be found until the bank breaks with water. If she is alive then something would have to give in order for her to be found and it would be to do with the situation she finds herself in either way alive or dead Marcia is hidden. Overall Iching does not look at Marcia being found as favourable. I have an inclination towards Newborough however that is vague even for me. However, there is a sports ground there and the five of wands can cover sporting events. Because of the connection to the Moon and Hill perhaps Haunting Hills Road might even be worth thinking about. No guarantees though. I note along princes highway there is a big body of water near an area called the Summit. I just want to point out these places again not really knowing whether they are significant or not. Adding a little more having read back on this reading, it is quite possible that Marcia was afraid and 'feared' being attacked and therefore went to a 'body of water' that can be anything but it is water of some kind and she may have hid out there away from her supposed assailant. Its possible that she gave herself away but these are all flashes which are hard to put together. I just somehow feel that she was safe in that position at that time though at some point I do see she hit her head and possibly as mentioned before lost her shoe. MMMM LOTS OF FOOD FOR THOUGHT. SHE WAS LOST AND SCARED AND MUST HAVE BEEN FOR A WHILE. I HOPE SHE IS SOMEWHERE SAFE AND IN PEACE ALTHOUGH I DO MISS THE MOTORBIKE RIDES. IT IS UNDERSTANDABLE IF SHE DOESNT WANT TO BE FOUND AS SHE WAS IN THE PROCESS OF CUTTING TIES WITH TOXIC PEOPLE IN HER LIFE. TA A SHEER FLUKE TO HAVE FOUND THIS SITE. Were you a friend of Marcia's? I did not know her nor anything about her life but I don't believe the toxic people you feel were in her life at the time were as toxic as someone else that was around her at the time. Why was her bro following her? what if there is no truck driver or he lied and didn't really speak to Marcia, had has his days confused and it wasn't Marcia he spoke to. What if the car was planted there? I don't understand anyone driving to Qld via Moe. What if someone moved into her house with strawberry blonde hair, reddish colored goat style beard who was at tafe learning to be a chef who had just bought new knives, was around at the time? I find it coincidental that I contacted missing persons unit last month - March, I got email yesterday and will be ringing police officer today. Don't believe what the papers tell you. They tell you very little. You can drive to QLD via the coast road in which case you pass thru Moe. I am sure it had something to do with the truck driver ?